The recently unveiled marine designs by South Korean Naval architecture studio CanariaOcean of their super yacht project has been inspired and named after the blue whale and has left many yearning to own this astounding beauty of the seas. Designed after the Rorqual Whale, or baleen whales and supposedly family to the largest animal that has ever lived on earth, the focal spotlight of the Blue Whale, pioneering designer Young ha Kim elucidates, was to exploit space efficiently. The slender and streamlined body of this steel and aluminum 37 m Blue Whale encases three double guest suites and accommodation for eight crew members. 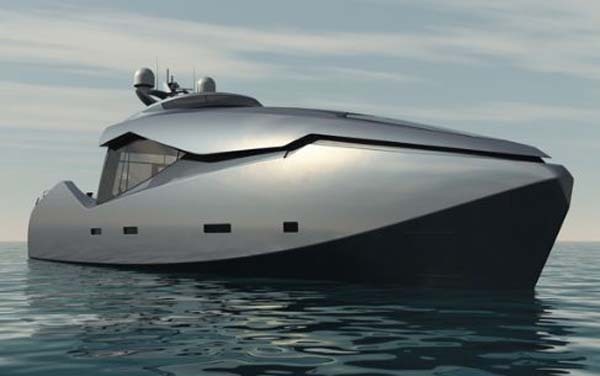 Designer Kim says that the bow of this luxurious cruiser is designed to resemble the mouth of a blue whale, and contains one of the striking features of this luxury yacht, the forward salon. This is actually the front window of the yacht but when required the glass roof slides up and lifts up the salon or a seating arrangement, enchanting guests with sweeping panoramic view up front. Also towards the rear, there lies one more interesting feature, the sliding cabin. The yacht here stretches out to offer a bonus interior space for guests to pleasure in and includes a swim platform. This expendable aft section can be used as a multi-utility section for guests to appreciate companionship or solitude while relaxing in deck chairs, sunbathing and enjoying a cocktail. The yacht’s wheelhouse is above the main deck to allow privacy of the guests away from the crew. The Blue Whale is powered by two 2500hp MTU engines, which can help it attain a top speed of upto 30 Knots per hour. Its sleek and swift exterior profile is inspired by the whales swimming form. It also features zero speed stabilizers that will help maintaining its low profile making it more stable.